I’ve always been fascinated with the Saints. Knowing that these holy people are up there in heaven doing miracles on earth just blows my mind. It isn’t that I don’t pray directly to Jesus and God- I do. It’s just that I love knowing there are these powerful and holy saints that are sitting up there, right next to Jesus, Mary, the angels, and God Almighty, and that they have my best interests at heart. Early on while trying to conceive I started praying to St. Gerard Majella who is the Catholic Patron Saint of Motherhood. There is a beautiful prayer to him for motherhood that someone gave me on a prayer card. That was how my obsession with praying to the saints for fertility started- small, with a simple prayer. I also become dedicated to St. Anne early on, and then St. Therese. I definitely think that they each interceded for me and helped me have my miracle baby. Read my story of how I found my miracle when the doctors said it was impossible here. Now, my interest in fertility saints has blossomed into writing my own prayers, visiting shrines, and praying to almost a dozen saints! 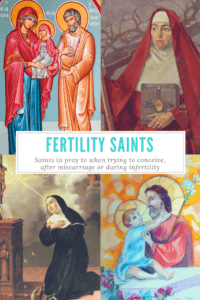 In this post I’m going to simply outline the Catholic Saints that are associated with fertility, healing infertility, healing the pain of miscarriage, pregnancy, and children. All of them are great to pray to for fertility. You can also pray to any saints that are special to you. For example, St. Therese de Lisieux is not commonly associated with fertility or motherhood, but she was my confirmation saint, so I feel connected to her and pray to her for all my requests. Eventually I hope to have a blog post up on each of these Saints. Additionally, in Catholic teaching, anyone who is in heaven is a “saint” even if the Vatican hasn’t canonized them as such. That means that you can pray to that virtuous great-grandmother of yours- I’m sure she is up there and you KNOW she wants you to get pregnant! I regularly pray to my beloved deceased for intervention. There is no right or wrong way to pray to these saints. You can pray however you want, you can ask however you want. However, many of them have special prayers or novenas that you might want to use. For some of these saints I have already posted full blog posts on their history, and in some cases I have written original prayers that are shared on the blog. For others, you may want to google prayers or more information. Remember, you can always freestyle your prayers in a conversation-like manor! It is up to you! *Remember that technically in Catholic tradition your are not praying to the saints for THEIR intercessions. Instead you are praying to them to intercede on your behalf to God for his action. The saints are not God- only God is God. I honor these saints in multiple ways. I pray to them, I keep their prayers cards, and for some of them, I have decorations up around the house in their honor. I also try to keep their memory on their feast day, and spread their word to other people who may benefit from it. If you are looking for decorations I recommend searching Etsy. Crafters make beautiful items honoring the saints! You can also follow my Pinterest board on Fertility Saints for more ideas! January 21- St. Agnes– Patron saint of childbirth, children, and maternal concerns. Prayed to by some for fertility. February 1- St. Brigid of Kildare – Patron Saint of Babies, but also special for healing women. Read my full blog post on her here – it includes an original prayer to her for a child! March 6 – Saint Collette– Patron Saint of women trying to conceive, expectant mothers, and of stillbirth. March 20 – St. Joseph– Patron Saint of Fathers – St. Joseph is also the protector of the home and family. He, of course, is the earthly father of Jesus, and is the perfect saint for the husband to pray to for fatherhood. March 24- St. Catherine of Sweden – Patron Saint of Protection Against Miscarriage. Read my full post on St. Catherine here and my original prayer to her! April 28- St. Gianna Beretta Molla – A very special modern saint, St. Gianna was a wife, mother and pediatrician. A working mother saint! She suffered two miscarriages herself, and is a matron saint of Motherhood. I recently visited her Shrine just north of Philadelphia, and it was a very meaningful visit for me. Read my full post on her and the original prayer to her I wrote! April 29- St. Catherine of Siena – Another patron Saint of Miscarriage Protection. May 22- St. Rita of Cascia– A powerful Saint who is the Patroness of Impossible Causes. For this reason she is considered the patron saint of Infertility. There is a beautiful shrine to her in Philadelphia that I recently visited, and I had a very powerful moment with her. Definitely add her to your list of Saints to pray to! I’m wearing her medal right now as I write this :-). Here is my full post on St. Rita and how she was part of my journey to my second successful pregnancy! June 13 – St. Anthony of Padua – Patron Saint Against Infertility and of Barren Women- St. Anthony is often pictured holding the baby Jesus and has gained a reputation for helping “sterile” women get pregnant. He is most well known as the Patron Saint of Lost Articles. A true story- Years ago I lost my great-grandmother’s diamond necklace. It was gone for one whole week and I was crushed. I sat down and prayed to St. Anthony for about thirty minutes. I imagined him bringing it to me and setting it in my hands. I opened my eyes, and looked around. It was on the floor next to the chair I was sitting in, arranged in a perfect necklace form as if it was in a jewelry box. I am not kidding! Read my full post on St. Anthony of Padua Patron Saint Against Infertility. July 20 – St. Margaret of Antioch – Patron saint of pregnant women and childbirth, often prayed to by couples trying to conceive. July 26- St. Anne and St. Joachim– St. Anne and Joachim were Mary’s parents, and the grandparents of Jesus. They struggled with infertility and were scorned by others for being barren. Joachim went to the wilderness for a forty day fast and Anne prayed under a laurel tree. An angel visits both of them, and they meet outside the city gates where they embrace. Some stories say that St. Anne (Ann, Anna, Ana), was in her 80s when she gave birth to Mary. I prayed to St. Anne for my miracle baby, and have always felt strongly connected to her (of course, she is my name saint!). August 11- St. Philomena– a Patron Saint of Hopeless Causes, including Sterility. She died at age 13 and so is also considered a patron saint of babies and children. She is known for healing illnesses and wounds overnight. August 31- St. Raymond Nonnatus– This Saint came into the world by an urgent medieval period c-section. For hundreds of years women have prayed to him for help in conceiving. Apparently the current Pope recommends him for couples struggling to conceive (see in comments below)! October 16- St. Gerard Majella– This is a heavy hitter! St. Gerard is the Patron Saint of Fertility and Pregnancy, and was the first Saint my Catholic relatives told me to pray to! My grandmother had 7 children and she always had a prayer card to St. Gerard lying around! November 5- St. Elizabeth– St. Elizabeth was barren for most of her life. The Angel Gabriel came to her husband Zachariah and promised him a son. She was the mother of John the Baptist. You might remember the Gospel story when the child John leaps in her womb when she embraces Mary who is pregnant with Jesus. November 23- St. Felicitas of Rome– Patron Saint of Sterility, Mothers of Sons, and Mothers who have lost children. She had seven sons, who became martyrs. In the Eastern Orthodox church her feast day is January 25. November 30 – St. Andrew– You can pray a special chaplet to him from November 30th until Christmas Eve to ask for his assistance in conceiving! December 6- St. Nicholas– Patron Saint of Infertile Men and of Children. St. Nick is sometimes known for bringing presents and leaving them in the shoes of children on December 6th (or the eve, December 5th). You might have heard him mentioned in songs about Santa Claus. Pray that he leaves some strong sperm for your husband! Read my full post on St. Nick here! December 9 – St. Hannah– Patron Saint of Childless Wives and Infertile Women. Hannah’s story is in the Book of Samuel, and she is infertile. She prays, and her prayers are answered- she gives birth to Samuel. She then goes on to have three more sons and two daughters. December 10 – St. Eulalia– Patron Saint against Miscarriage. I can’t find anything more on her story in relation to miscarriage or fertility other than this. I’ll update if I find anything! Our Lady of Guadalupe– Our Lady is of course St. Mary, mother of Jesus. People pray to her as a special helper of pregnant women and protectoress of the unborn. San Padre Pio– Known as a healer, he can be prayed to for healing problems that might be affecting infertility. Archangel Gabriel– Gabriel was the angel who appeared to May to ask if she would be the mother of God. Many women pray to him to ask for pregnancy. Saint Perpetua– A martyr killed days after giving birth in prison, she is considered a patron saint of expectant mothers, but is often prayed to by women seeking pregnancy,. Am I missing any? Please let me know! Feel free to leave your prayers to the Saints in the comments! How I got Happy, Healthy & Pregnant! Want to know how I got happy, healthy, and pregnant in less than 3 months after 2 years of infertility and miscarriages? You need my list of the 79 diet and lifestyle changes I made that transformed my life and brought my miracle baby to me! Please pray to St. Gianna Boretta Molla and read all about her. You can read about her on my website, and then follow the link to her shrine, where you can type your prayer submissions and the members of her Society will pray for you. They print the prayer submissions and put them right at the feet of her statue in the shrine. I will pray for your little grandbaby now! I am so similar to you. We have been trying ten years this October. We visited st Anne shrine in Scranton pa 3 times on her feast day after my priest said to pray to her. As you know, she is the mother of the blessed mother and conceived her at a late age. We have also been to St. Gerard shrine three times in Newark New Jersey on his feast day, 10/16 which is also our anniversary. We say his prayer every night together. We went to Saint Gianna shrine in phila after I had surgery to open my fallopian tube’s. My doctor prayed the st Gianna prayer over me prior to surgery. We went to Saint jude shrine in Baltimore. We went to Saint Padre Pio shrine in Barto Pennsylvania. We went to Saint Rita’s in Philadelphia after I had an Iui. I have faith it will happen for us but we have waited so long, it is very painful. Thank you for your comment! I didn’t know of those other shrines in NJ and PA, I will be sure to visit them! I truly believe that St. Anne and St. Gerard helped me conceive my first miracle, and I believe that St. GIanna and St. Rita are working miracles for me right now. Your faith is so strong. What a blessing that your doctor prayed the prayer over you prior to surgery. 10 years is a very long time to wait on your miracle. Your faith is strong. I am praying for your right now! Please come back and leave a comment if you visit any other shrines, so that I might know where they are! To add, I have icons and statues and prayer cards with all of them all over my house. I pray unceasingly every day. I know it is meant for us but 10 years is a long time to feel so empty. Hi thanks so much for all Ur work. Am from Nigeria and seeing everything u at doing, I truly appreciate. May the lord answer us all. I have suffered two miscarriages my self but praying and hoping on the lord to make a way. Thank you for sharing this post. I cried as I prayed to each of them. St. Margaret of Antioch and St. Agnes are also infertility saints, as is Sarah, Abraham’s wife. She is the original story of infertility in the Bible. Thank you Lucy!! I am so glad you felt a powerful connection as you prayed!! I will add in St. Margaret and St. Agnes after I research them- I didn’t know about them, thank you! It’s funny I know about Sarah, but I forget that she is a Saint. I will add in her as well! Blessings! I prayed to St Margaret for my daughter and myself. I was in danger of uterine rupture my entire pregnancy and my daughter’s kidneys were not functioning in utero. I received her prayer card in my 8th month and carried her full term and she was born with 2 healthy kidneys. Thank God! What a beautiful miracle, thank you for sharing! I will have to add St. Margaret to the list!!! Hi Sabrina! I’m glad you enjoyed the list! It’s funny, I thought I had put a note in the post about how we are praying for them to intercede on our behalf TO GOD, as they are closer to God than we are. But, I guess I hadn’t. I put in a note clarifying that we aren’t asking the Saints to perform the miracle- we are asking them to ask God for us to perform a miracle. It’s hard for me to give up the word “to” because I’m saying “Please, St. Anne, intercede on my behalf and beseech the Lord our God to grant me . .. .etc.” So while I’m technically praying with her, it feels like I’m praying to her for intercession. While still beleiving it is God that performs the miracle. Does this seem sufficient to you, and like it adheres to correct Catholic doctrine? Hi Anna thanks for this wonderful list of saints to pray through! We had a miscarriage 4 months ago and on the 4 month anniversary which is also my deceased grandmothers birthday(who i was very close with) I got a positive pregnancy test. They had me get a blood test and my HCG is only at 8. It’s possible that it is normal because of how early it is but I’m also trying to find some peace with the fact that we may experience another loss. I go back in two days to get my blood drawn again and pray in the meantime that the levels rise. I have a very special connection with St. Giana with her being my confirmation saint and St. Anne being my namesake (middle name). If you could remember me in your prayers the next couple days I would be extremely grateful. Thank you! I am sorry for your loss four months ago, and I feel your hope and nervousness with this new pregnancy! It is so hard in those early days! I will pray for you, and St. Gianna and St. Anne are perfect for you to pray to as well. Be well, and baby dust!! Thanks so much for this list and for the positive vibes you’re emitting! You’re message gave me comfort…knowing that there are women out there with the same goal as me and we’re all rooting for each other. I can’t remember the last time I prayed this hard. After finishing my rosary tonight, I decided to google search for saints of fertility and that’s how I came across your writing. My husband and I got married this past March and we have been trying to conceive since September. I know it hasn’t been too long but I’m 38 with somewhat irregular periods and found out last year that I have a small fibroid. All these factors affected my hope and I cried when I got my period a few days ago. I’m focusing on my faith and prayers now and would greatly appreciate your prayer for us. I visited Saint Anne Basilica in Quebec a few years back and it was magnificent, so perhaps I will pick her to pray with me for now. Do you have a specific prayer that you recommend for St. Anne? Saint Martha is my saint name. Do you have any information on Saint Martha? Which saint(s) is(are) best for me to ask to pray with me? Thanks again and I hope to hear from you! God bless you and all the women on here! I pray that God will bless all of us with happy and healthy children. I’ll end with Luke: seek and you shall find, ask and you shall receive. What a nice message :-). I am praying for you, and wish you many blessings on your journey to your baby!! I love St. Anne, but I haven’t written a post or a specific prayer to her yet. I prayed a novena to her when trying to conceive my son, and now just openly pray to her (no set prayer). It is on my agenda to write one though! I don’t have information on St. Martha, but if you feel close to her definitely pray to her! It sounds like you have just started trying recently so hopefully you will get pregnant quickly and easily. For people who feel like their fertility situation is a “lost cause” I strongly suggest praying to St. Rita of Cascia. She helps make the impossible possible. But for you St. Anne and St. Martha might be just the ticket :-). And our Holy Mother of course. Be well, and be fruitful! Baby dust! Thank you so much for this list! I’m not Catholic, (raised Baptist) but I’ve always thought Catholicism was so interesting, the dedication to traditions &… Ceremony is just amazing to me! Thank you so much for this beautiful post. We are struggling with male factor infertility, but I feel connected to Saints Felicity and Perpetua, who are martyrs killed days after giving birth in prison. They are considered patron saints of expectant mothers. This list is a big inspiration to me, thank you. Cassandra! Wow! I didn’t know about Felicity and Perpetua :-). If I ever do a list for expectant mothers, I’ll be sure to add them! Definitely pray to whomever you feel most connected!! Be well and baby dust!! St. Padre Pio is known for being a healer. He can be prayed to for healing the problems that might be affecting fertility. Also the Angel Gabriel came to Mary to ask if she would be the mother of God. Both of these saints can be prayed to for intercession. I am currently saying a novena to the Sacred Heart of Jesus for my daughter, Meryl. May the Lord anoint you in this ministry and thank you in advance for prayers. Thank you Liz!! These is good information!! I will say a prayer for your daughter Meryl right now! Thanks Anna for creating this list. I didn’t know there were so many Saints we could turn to for help. Is there a specific way of praying that you find most helpful? For my honeymoon, I was lucky enough to meet the Pope and ask for his Blessing. I knew it would be hard to start a family because I have PCOS. He told me to pray to Saint Raymond. It’s been 2 years, and I don’t think I am doing it right. I usually just pray to God but, I am ready to start begging and pleading. Meghan- Blessings to you! So glad to hear your testimonial and I hope you have success again soon!! I feel like the Holy Spirit lead me to this site today. My husband and I have been on this journey of infertility for 4 years now. My husband was diagnosed with Kilenfelters syndrome which is a genetic mutation causing testicular dysfunction. Basically my husband is sterile. It’s been so hard to deal with accepting what doctors have been telling us. Basically are chances to conceive naturally is 1%. We can do IVF or sperm donor. We are staying true to our Catholic Faith and believing in a miracle of God’s grace we will become parents one day! Reading this blog today I realized all these saints have been surrounding me and my husband and I have not really been paying attention to them. As I’m writing this tears of JOY are falling down my face!! My heart has been telling me Don’t worry everything will be ok. Everything will be ok, God’s will is always better than our own! Thank you for sharing and helping all of us on this journey! Gina, I’m so glad you found this post and remembered that Saints are with you! I pray that your miracle and am sending you hugs and baby dust!! Hi Anna! Just an observation, I read a few sources that says the feast day of St. Gerard was Oct. 16. It says on your list it’s Sept. 29? Yikes, thank you for the catch! I wonder how I made that mistake! Just fixed in the post! Oh good thinking!! Thank you! I didn’t see you mention Felicitas of Rome (more commonly called St. Felicity). There are two saints named Felicitas. The first is from Carthage and is associated with St. Perpetua, both of whom are patrons of mothers and expectant mothers. Felicitas of Rome is patron of sterility, mothers of sons and mothers who have lost children. There is a Felicity cross, although I’m not sure to which Felicity it belongs. Both Feliticies were a blessing to me. I had no idea!! Thank you, I will research St. Felicitas of Rome and add her! We visited the San Francisco de Asís Church, Monastery and Catacombs in Cusco, Peru on our honeymoon. We didn’t know but there was a shrine inside and our guide said it was in honor of a fertility saint, and that if we wished my wife could write out a prayer and leave it there with the others. Any chance you might know the name of this saint? We would like to mention this experience in her upcoming dedication ceremony. There is a photo on Trip Advisor which is captioned nuestra Sra. de la Oh – la Virgencita de la fertilidad. Google searches for this phrase return only spanish pages. Thanks for any help you might be able to provide. How fascinating!! I have no idea, but clearly I need to travel to Cusco!! It’s on my list anyway!!! 🙂 Blessings to you! Check out St. Cunegunda. She’s a German saint invoked in pregnancy.